ST- segment elevation myocardial infarction (STEMI): MI as defined as in acute myocardial infarction, with ST-segment elevation more than 0.1 mV in two or more contiguous leads, and elevated cardiac biomarkers. 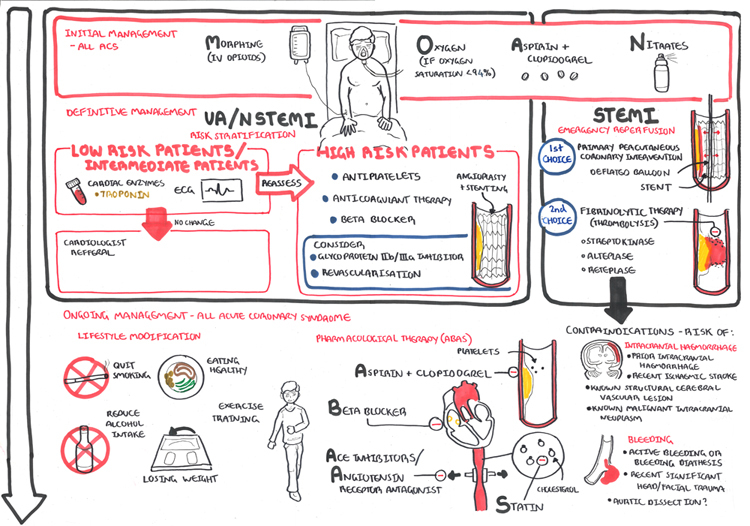 Non-ST segment elevation myocardial infarction (NSTEMI): MI, but without ST-segment elevation. May have other ECG changes, such as ST-segment depression or T-wave inversion. Will have elevated cardiac biomarkers. Clinical Presentation Retrosternal Pain (for at least 30min), which radiates to the neck, arms and jaw. The pain is described as crushing, heaviness or like a tight band. Worse with physical or emotional exertion. Not relieved by rest. Nitrate spray (within a couple of minutes) may not always relieve the pain. Acute coronary syndrome may be accompanied with diaphoresis, feeling of impending doom and breathless. Troponin T (cTNT) and Troponin (cTNl) are proteins virtually exclusive to cardiac myocytes. They are highly specific and sensitive, but are only maximally accurate after 12 hours. Think Don’t be fooled by normal cardiac enzymes. A fresh MI (< 30 minutes) may not yet show elevated blood levels. Remember Troponin can be released into blood when cardiac muscle is damaged by pericarditis, PE with a large clot or sepsis. Renal failure also reduces the rate of troponin excretion. Elevation of the ST segment (>1mm) in contiguous leads, depending upon the location of the MI. Q waves are typically absent but can occur, and the duration of the ST and T wave changes is variable. Remember The deeper the q- wave the longer the infarction has been. ST Elevation Infarction of cardiac muscles results in ECG changes that evolve over hours, days and weeks in relatively predictable fashion. Location of myocardial infarction can be identified with the ECG leads. Think An ST-segment elevation on ECG indicates that the infarction extends through the full thickness of the myocardial wall (transmural). 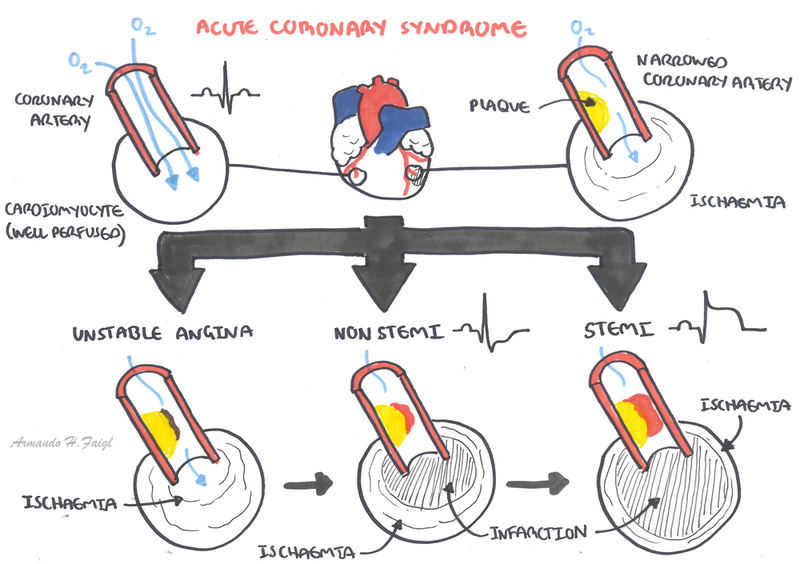 The absence of ST-segment elevation in the setting of cardiac enzymes indicates that the infarction is limited to the subendocardium. NSTEMIs are dangerous in that the patient is still at risk for a full-thickness infarct in that area. PCI: Percutaneous coronary intervention (angioplasty and/or stenting). Excluding other diagnoses that might mimic acute MI but would not benefit from or might be worsened by anticoagulation or thrombolysis (eg, acute pericarditis, aortic dissection). No contraindications to reperfusion therapy. 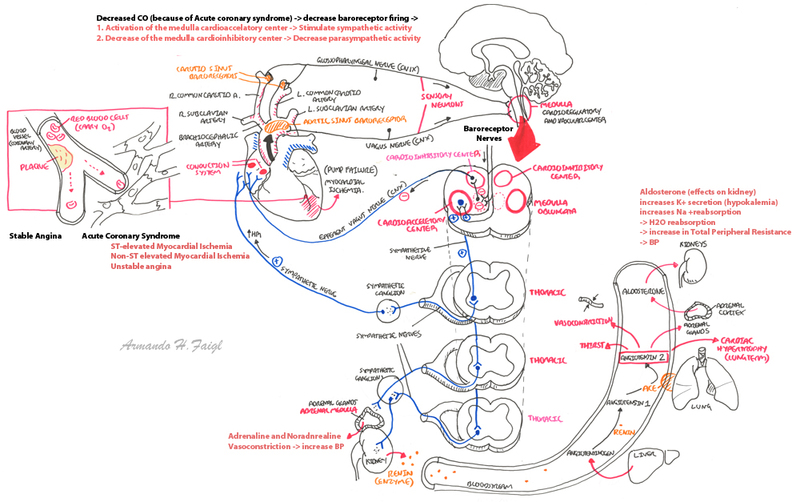 Pharmacology Thrombolytics break down/dissolve clots. It is used to treat stroke, pulmonary embolism and myocardial infarction. Three main thrombolytic drugs: tissue plasminogen activator, streptokinase, andurokinase. Side effects: major bleeding, cardiac arrhythmias, cholesterol embolus syndrome, anaphylactoid reaction, cerebrovascular accident, intracraneal hemorrhage. Steptokinase specific adverse effects: Non-cardiogenic pulmonary edema, hypotension, fever and shivering. Long-term anticoagulation to prevent emboli from left ventricular mural thrombus should be considered in patients who have suffered a large myocardial infarction, particularly if a large akinetic/dyskinetic area is present. Dressler’s Syndrome This is a type of pericarditis that can develops 2-10 weeks after an MI, heart surgery (or even pacemaker insertion).